On Friday, Jan. 28 in Antarctica, a research team investigating the last 100,000 years of Earth's climate history reached an important milestone completing the main ice core to a depth of 3,331 meters (10,928 feet) at West Antarctic Ice Sheet Divide (WAIS). The project will be completed over the next two years with some additional coring and borehole logging to obtain additional information and samples of the ice for the study of the climate record contained in the core. A researcher examines layers in a snow pit deposited by different storms. As part of the project, begun six years ago, the team, funded by the National Science Foundation (NSF), has been drilling deep into the ice at the WAIS Divide site and recovering and analyzing ice cores for clues about how changes in the concentration of greenhouse gases in the atmosphere have influenced the Earth's climate over time. Friday's milestone was reached at a depth of 3,331 meters--about two miles deep--creating the deepest ice core ever drilled by the U.S. and the second deepest ice core ever drilled by any group, second only to the ice core drilled at Russia's Vostok Station as part of a joint French/U.S./Russian collaboration in the 1990s. "By improving our understanding of how natural changes in greenhouse gas influenced climate in the past, the science community will be able to do a better job of predicting future climate changes caused by the emissions of greenhouse gases by human activity," said Kendrick Taylor, chief scientist for the WAIS Divide Ice Core Project. "This location was selected because it is the best place on the planet to determine how greenhouse gases have changed during the last 100,000 years," Taylor said. Since it began, the WAIS Divide Ice Core Project has continuously collected ice from the surface down to a depth of 3,331 meters. The ice at this depth fell as snow about 100,000 years ago. The high annual snowfall at the site enables individual annual layers of snowfall to be identified and counted (much like counting tree rings) back to about 40,000 years. Below that, the layers become too compressed to allow annual layers to be resolved. Scientists hope for at least decadal resolution to this point, sufficient for the science goals to be achieved. 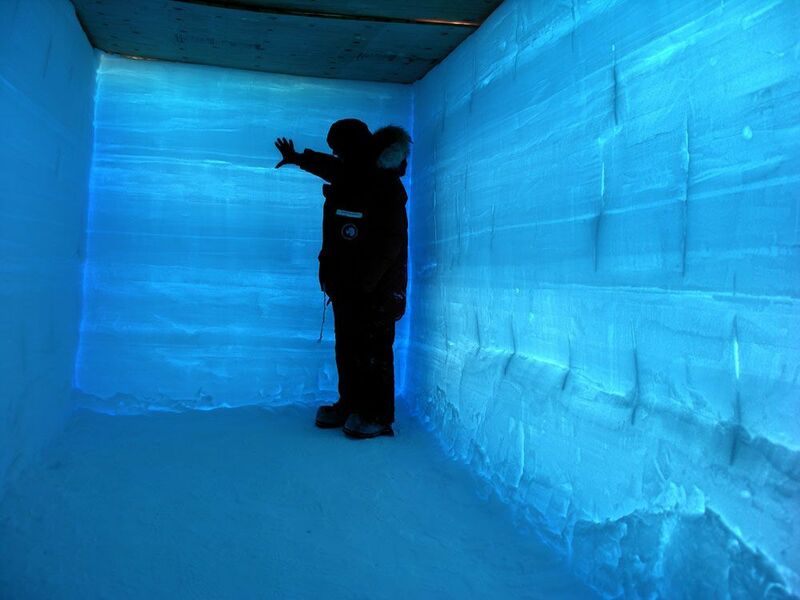 The ice cores are 13-centimeter (5-inch) diameter cylinders of ice collected from deep in the ice sheet. Over time, the ice has formed when snow was compacted at the surface by subsequent snowfall. The compacted snow contains dust, chemicals and atmospheric gases, which are trapped in the ice. The dust and other impurities in the ice are indicators of past climate, and the gas contained in air bubbles is a sample of the ancient atmosphere. The deeper the ice, the further back in time measurements can be made. In addition to measuring what the atmospheric concentrations of carbon dioxide, methane and other gases were in the past, the research team can also determine what the surface air temperature was in the past by studying changes in the isotopic composition of the water that makes up the ice. The past atmospheric concentrations of the gases krypton and xenon are used to determine what the average temperature of the ocean was in the past. The 13-centimeter diameter 3,331-meter-long ice core is cut into 1 meter (3 feet)-long pieces of ice and sent by ship and refrigerated truck to the NSF National Ice Core Laboratory in Denver, Colo. The ice is cut into smaller samples and sent to 27 investigators around the U.S., who make the measurements. "Previous ice cores have shown that the current level of greenhouse gases is greater now than at any time during the last 650,000 years, and that concentrations today are increasing at the fastest rate," Taylor said. "This increase is caused by human activity and is forcing the climate into a configuration that no human has ever experienced." The WAIS Divide Ice Core Project is specifically investigating the small timing offsets between past changes in the atmospheric concentration of greenhouse gases and changes in temperature. By understanding these timing offsets, the research team can determine the role that changes in ocean circulation had in the release of carbon dioxide from the ocean and how an increase in carbon dioxide in the atmosphere warms the planet. The drilling ceased 100 meters (328 feet) above the contact between the ice and the underlying rock, to avoid contaminating a possible water layer at the ice-rock contact. The basal water system may consist of water-saturated, ground-up rock, and has not been exposed to the earth's surface for millions of years. It may harbor a unique and pristine biological environment that the U.S. Antarctic Program does not wish to contaminate. The core taken by the WAIS Ice Core Drilling Project is crucial for fine-tuning the researchers' understanding of how the oceans, atmosphere and climate interact during climate changes. A Danish-led team recovered an ice core from Greenland this past summer with similar time resolution to the WAIS Divide record. The two cores provide an opportunity to compare the response of the northern and southern hemispheres to climate changes. The Greenland ice core cannot be used to study changes in the atmospheric concentration of carbon dioxide because there is too much dust in the Greenland ice, which decomposes and releases non-atmospheric carbon dioxide into the ice. NSF's Office of Polar Programs funds this research, primarily through its Antarctic Glaciology Program. "We still have two more field seasons of work to complete the project, and reaching this goal should allow us to complete the project on schedule," said Julie Palais, program director. "In addition, we are hoping to get as long a record as possible from this site, and getting all of the ice we planned on this year will allow the science community to do the work that they are funded to do. Drilling the ice core is just the first step in the process, albeit a very important one." Some additional funding is provided by NSF's Antarctic Organisms and Ecosystems Program. Logistical and drilling support is from NSF's Divisions of Antarctic Infrastructure and Logistics and Antarctic Science. The lead institution is DRI which is part of the Nevada System of Higher Education. Science coordination is provided by the University of New Hampshire.